Mark "color combinations" down as another thing the French have mastered. With the spring/summer 2019 fashion month now in our rearview mirror, it’s high time we reflect on everything we’ve seen — from trending materials to cool colors. 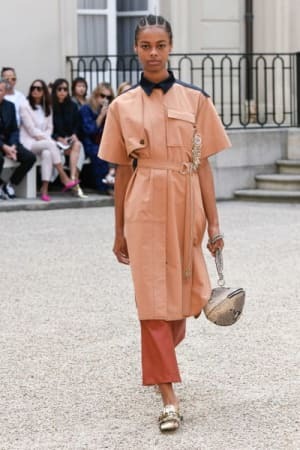 And when it comes to unexpected palettes and combinations, it should come as no surprise that some of the most interesting ones came courtesy of the Paris shows. Warm golden tones offset by icy blues, tonal terra-cotta neutrals that feel so appropriate for fall… our favorite color palettes from the ready-to-wear shows are equally about striking differences as they are about complementary hues. Suffice it to say, there is a lot we can’t wait to commandeer ASAP and repurpose for our interiors. 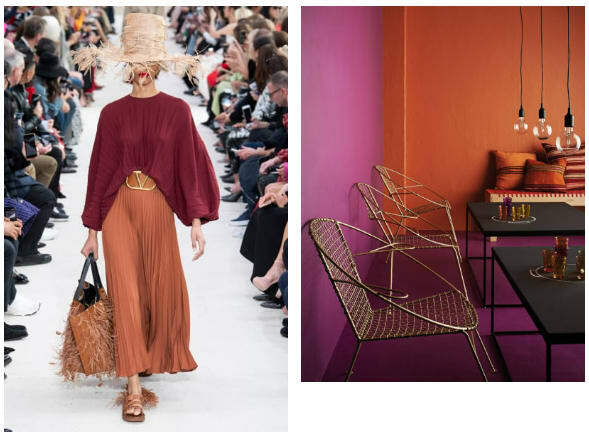 If you feel the same way, here are some of the chicest fashion-inspired color combos we saw in Paris. The ultimate French "it" girl palette awaits you. Two of autumn’s most quintessential hues paired together in quite the statement-making manner. For those not afraid to pack a bold punch with their home’s style, this palette is a maximalist’s dream. 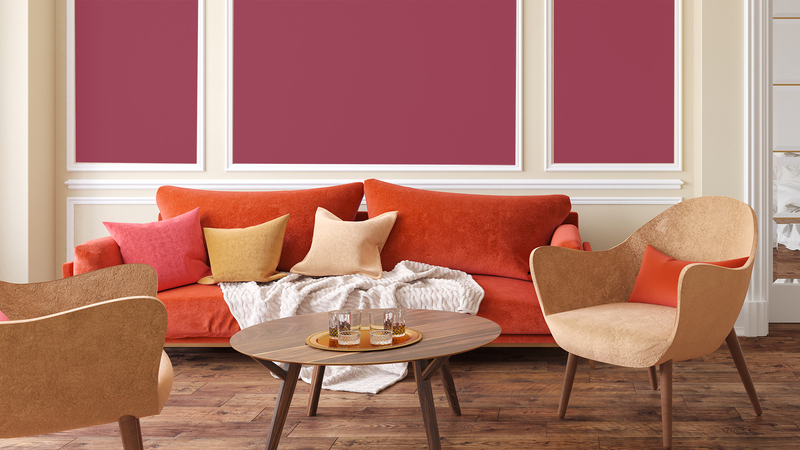 Coat your walls in the saturated hues — maybe a two-tone situation is in order — and bring in furnishings in similar colors to complete the look. Areaware’s popular sculptural candles in terra-cotta (totem candle, $12 and up at Areaware) make for the ideal accents to your curated bookshelf or living room end table. For a textural sofa companion, AYTM offers a gorgeous geographic-print throw blanket (Contra throw, $210 at Moda Operandi) in a deep berry hue. 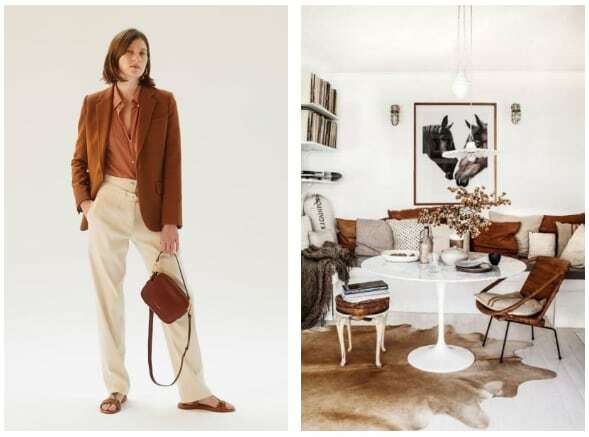 On the other end of the color spectrum, you will find this warm combination of neutrals. This year, we’re all about making the simplest of hues feel interesting by implementing a tonal palette; gradient shades of cream, terra-cotta and coffee are ideal for crafting a calming oasis in any room of the house. Allow a clean off-white to set the base (nothing too starkly white, as that’ll feel sterile) and proceed to layer with colors, textures and accent pieces… the more the better. Start with a honey-hued rug (Wyatt woven rug, $24 and up at Urban Outfitters) and keep going. Ferm Living’s corduroy cushion (corduroy cushion, $68 at Ferm Living) brings a ’70s kick while Minna’s woven cream throw blanket (Marta throw, $150 at Minna) will keep you cozy in the impending winter months. We have a thing for monochromatic tonals. This time, it’s courtesy of Joseph’s beautiful presentation, which inspired us to try our hands at earthy greens. 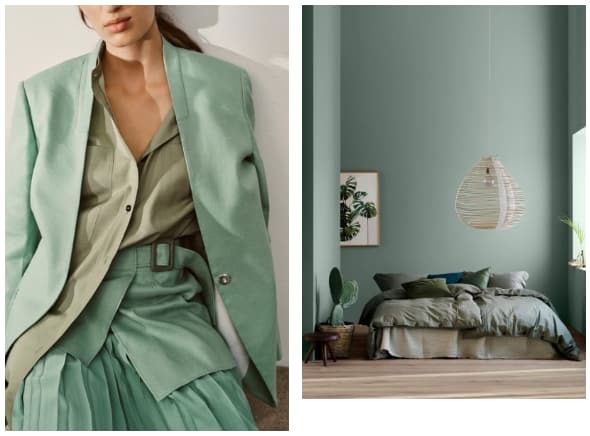 Particularly perfect for the bedroom, a mix of soft greens will Zen you right out. Switch up your bedding this season, surrendering your plain whites for a crisp, khaki green alternative (washed cotton duvet cover set, $29.99 at H&M). If your built-in overhead lighting isn’t working out for you, you can’t go wrong with a statement pendant. Good Thing’s conical lamp (clover pendant, $750 at Good Thing) is an investment worth the splurge. 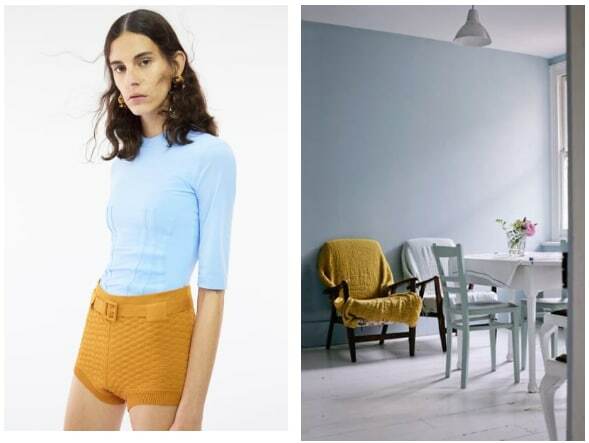 Given that yellow and blue are near opposites on the color wheel, this pairing is all about the shock effect of having two viscerally different hues in one space. Play off the juxtaposition by corralling decorative details that drastically differ by style, all within the same space. For example, the stark minimalism of Hay’s blue-gray dining room chairs (Elementarie chairs, $125 at MoMA Design Store) plays well with a golden yellow antique rug (Peko rug, $656 at Revival) versus a similarly contemporary textile. It’s all about balance and contrast. Two of the year’s trendiest hues paired in a way that still feels new. 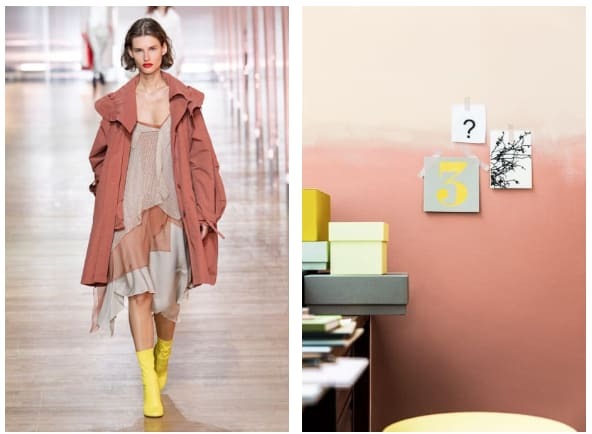 Dusty rose — an elevated take on the perennially popular millennial pink — is the ideal backdrop for pops of zingy citron. To keep your space from feeling too feminine, experiment with an ombré paint detail, which can be yours at the cost of a few hours of dedication and a sponge applicator. If you’d rather contain your bursts of pink to something requiring less commitment than a new paint job, look to your dining room table. Once Milano’s linen tabletop textiles are all so great, and this rosy runner (crushed linen runner, $63 at MatchesFashion.com) feels both contemporary and classic. Add on this vibrant ceramic vase (Raawi strøm vase, $60 at MoMA Design Store) for a sculptural element that also establishes height. 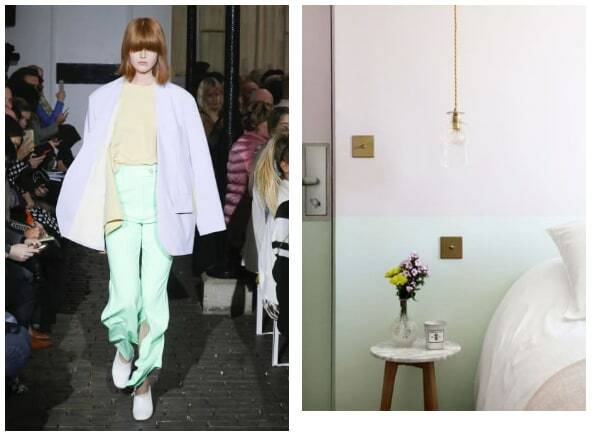 Apparently, the ice cream pastels we loved so much earlier this year have a longer shelf-life than expected, which is great news if you missed the boat on the initial push for the trend and want to try your hand the second time around (thank you, Natalia Alaverdian, for keeping them alive in your A.W.A.K.E Parisian runway debut). There are two ways you can approach this trend. The first: Give into it with abandon, painting old furniture and accent walls in your favorite shade of pastel. Try a two-tone wall or paint one of your doors a pale blush. The second option is a bit less risky (particularly for any renters) and entails infusing small hints of pastel wherever you can. A tiny mint vase (bud vase, $55 at Tiny Badger Ceramics) or some sky-blue linen pillows (simple linen pillow, $85 at Hawkins New York), for example. Desert hues are an all-time fave here at team Domino, and we’re happy to see our Parisian counterparts jumping on the bandwagon too. Deep rusts, blush pinks and all other colors of the sunset are inspiring us right now — especially as we look to the impending gray weather and seek to counteract it with warm, cozy interiors. You can’t go wrong with a subdued pink-tinted room, but bring on the gradient by picking up furniture in complementary shades. A mod sofa in plush velvet sprinkles a bit of opulence into any living room (Vera sofa, $2,598 at Anthropologie), as does a rustic-looking armchair in a deep raspberry (Henri deconstructed armchair, $1,118 at Dassie Artisan). Finish your space off with a pale-pink pillow (washed linen cushion cover, $12.99 at H&M) for the perfect tonal space.